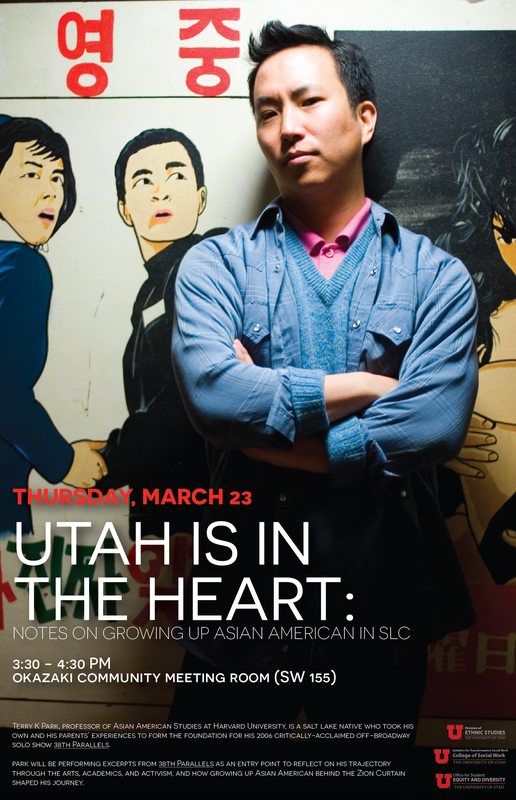 Terry K Park, the son of Korean immigrant small business owners, came of age in Salt Lake City in the 1980s and 90s. This experience, in conjunction with the experiences of his parents before and during the Korean War, helped form the foundation for Park’s 2006 critically-acclaimed off-Broadway solo show, 38th Parallels. Now a professor of Asian American Studies at Harvard University, Dr. Park returns to Utah, and to the University of Utah (which much of his family attended), to perform excerpts from 38th Parallels as an entry point to reflect on his trajectory through the arts, academics, and activism, and how growing up Asian American behind the Zion Curtain shaped the stage of Park’s journey. Dr. Terry K Park is an Asian American Studies scholar, activist, and former performance artist. Currently a lecturer in History & Literature at Harvard University, Dr. Park has taught Asian American Studies courses at Wellesley College, Miami University, Hunter College, the University of California, Davis, and San Quentin State Prison. He received his PhD in Cultural Studies, with a designated emphasis in Performance and Practice, from UC Davis. Included on the list, “Inspiring Activists: Trailblazers and leaders in the community and in the struggle for social justice” by San Francisco Supervisor Jane Kim, Dr. Park has also participated in several community-based Asian American organizations, including a stint as Executive Director of Hyphen magazine. A proud graduate of Lowell Elementary and Bryant Middle School, Dr. Park also attended East High and West High. His siblings were the founding members of the Asian American Student Association at the U.